Mariners versus the Giants, or in other words, David versus Goliath. The Mariners had dropped 5 straight coming into the series against the Giants and Ryan Vogelsong led San Francisco to a 4 - 2 victory in game one of the series this weekend. As the Mariners notched a win over Tim Lincecum on Saturday, they were looking to take the series and win their 2nd straight game against the Giants best pitcher, Madison Bumgarner. San Francisco got on the board in the first inning as Felix Hernandez struggled. Things didn't look good at all out of the gate for the King as he used 30 pitches to get out of the first inning. He gave up an RBI single to Angel Pagan and then walked a batter to load the bases before getting out of the jam. The Mariners would get that run back in the bottom of the second as Casper Wells led off the inning with a single and with one out, Miguel Olivo doubled. Dustin Ackley hit a sac fly that scored Wells from third base and we were tied at one a piece. The fly ball was to shallow center and the throw was a good throw home, but Wells managed to slide around the tag and was called safe. The score would remain 1 to 1 all the way into the ninth inning. After some more tough spots for Felix, he would wind up going 7 innings allowing just the 1 run and striking out 7. Brandon League pitched a scoreless 8th inning and managed to give up 2 hits. Justin Smoak made a terrific diving stop at first to save a run, the game and League as the game went into the 9th. Tom Wilhelmsen came out to pitch the ninth and struggled as well. With one out he gave up a single to Emmanuel Burriss and then walked Gregor Blanco and Pablo Sandoval. Just to make things a little more interesting I suppose. Still only one out, Wilhemsen got Melky Cabrera to strike out swinging on a foul tip and then with a full count to Nate Schierholtz he induced a ground ball to Dustin Ackley at 2nd base to end the pressure filled inning. The bottom of the ninth started out great for the M's as Kyle Seager and Jesus Montero both singled and the Mariners were in business with runners at 1st and 2nd and nobody out. Chone Figgins came in to run for Seager. Michael Saunders tried to advance the runners with a sac bunt and hit it back to the pitcher and Figgy was forced out at third base. Munenori Kawasaki came in to run for Montero and Justin Smoak came to the plate. Smoak hit a soft line drive into left field and Kawasaki was off to the races from second base. He almost stopped at third base but decided to go for it and it could have cost the team, but instead, the ball thrown by Melky Cabrera would hit Kawasaki in the back and bounce off toward the first base line allowing him to score and the Mariners to win the game. 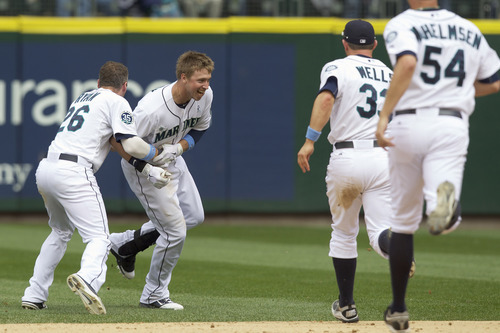 A walk off single for Justin Smoak and a Dustin Ackley sac fly would be all the Mariners would need to win this one. As the Mariners finished off their last two games here at Safeco, it looked as though we changed things up a bit and really started to play small ball. Bunting Michael Saunders in the 9th was a great thing to see, although it didn't pan out, this is the type of ball that is going to win games for the Mariners at home and we really proved that these past two days. I hope that Jack Z and Eric Wedge start to realize that. Now that we go on the road, we can bring out the big sticks again and really try and hammer the ball all over the place. We proved we could do it last road trip, let's hope we can do it again. The Mariners finished off the home stand in a beautiful way and it appears to me that the King may be back in action. Typically Felix is terrible in May with a record of 10 and 20 in his career during that month, so now that we are past that, I think we may see Felix shine once again from here on out. Other News:Oliver Perez was brought up to the big league squad in place of Steve Delabar who was just brought up to replace Alex Liddi. He has already moved up and down a couple of times already and he hasn't pitched horribly bad. Perez hasn't pitched in the big leagues in over a year, but now he is up with the Mariners. The Mariners also decided to DFA Chih-Hsien Chiang who came over in the Erik Bedard deal from the Red Sox. If Chiang ends up going to another team, Seattle will finally be done with the Erik Bedard deal, getting nothing for him coming here and now, getting nothing for him leaving either. Priceless!